Virtually all ecosystems on Earth depend on photosynthesis as their source of energy, and all free oxygen on the planet, including that in the atmosphere, originates from photosynthesis. The overall reaction is the reverse of respiration, which releases energy by oxidizing carbohydrates to produce CO 2 and water. Photosynthesis and respiration are linked ecologically, being the cellular metabolic processes that drive the carbon and oxygen cycles. 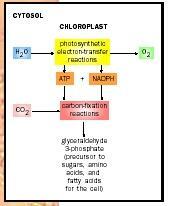 An overview of the photosynthetic process. bacteria it occurs on the plasma membrane and in the cytosol . The remainder of this discussion will refer to photosynthesis in chloroplasts of plants. The light reactions, which convert the energy in light into chemical energy, take place within the thylakoid membranes of the chloroplasts, whereas the dark reactions, which use that chemical energy to fix CO 2 into organic molecules, take place in the stroma of the chloroplast. In the light reactions, the energy of light is used to "split water," stripping a pair of electrons from it (and causing the two hydrogens to be lost), thus generating molecular oxygen. The energy in light is transferred to these electrons, and is then used to generate adenosine triphosphate ( ATP ) and the electron carrier NADPH. These two products carry the energy and electrons generated in the light reactions to the stroma, where they are used by the dark reactions to synthesize sugars from CO 2 . The fate of these electrons depends on which photosystem they arose from. Electrons from photosystem I are passed down a short electron transport chain to reduce NADP to NADPH (which also gains an H ion ). Electrons from photosystem II are passed down a longer electron transport chain, eventually arriving at photosystem I, where they replace the electrons given up by photosystem I's reaction center. Along the way, the energy released by the electrons is used to make ATP in a process called photophosphorylation. Many of the molecular details of this ATP-generating system are similar to those used by the mitochondrion in oxidative phosphorylation . (Phosphorylation refers to the addition of a phosphate group to adenosine diphosphate [ADP] to form ATP.) 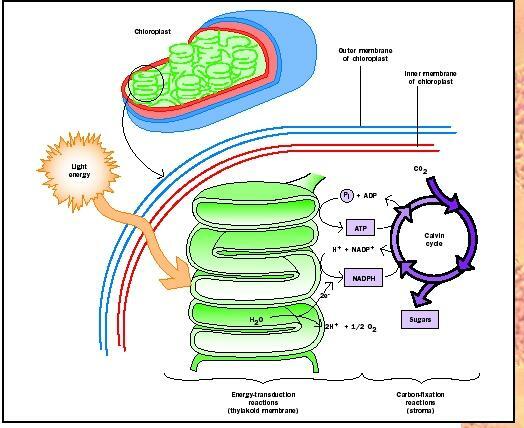 Like the mitochondrion, the chloroplast uses an electron transport chain, and ATP synthetase to create ATP. The carbon fixation cycle transforms simple, inorganic compounds of carbon into more complex forms of organic matter. The NADPH and ATP generated in the light reactions enter the stroma, where they participate in the dark reactions. Energy and electrons provided by ATP and NADPH, respectively, are used to incorporate CO 2 into carbohydrate via a cyclic pathway called the Calvin-Benson cycle. In this complex pathway, the CO 2 is added to the five-carbon sugar ribulose bisphosphate to form a six-carbon unstable intermediate, which immediately breaks down to two three-carbon molecules. These then go through the rest of the cycle, regenerating ribulose bisphosphate as well as the three-carbon sugar glyceraldehyde phosphate. It takes three turns of the cycle to produce one glyceraldehyde phosphate, which leaves the cycle to form glucose or other sugars. Some plants bind CO 2 into a four-carbon compound before performing the Calvin-Benson cycle. Such plants are known as C4 plants or CAM plants, depending on the details of the CO 2 capture process. Bishop, M. B., and C. B. Bishop. "Photosynthesis and Carbon Dioxide Fixation." Journal of Chemical Education 64 (1987): 302–305. Govindjee, and W. J. Coleman. "How Plants Make O 2 ." Scientific American 262 (February 1990): 50–58. 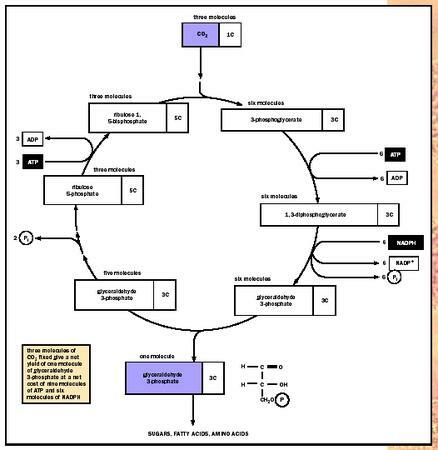 please post the real and ralistic diagram of photosynthesis reaction which is the light and dark reacton ..
thank you very very much biologyreference.com! !